Add the buttermilk, egg and melted butter. Mix the ingredients and add the drops of green food coloring. Heat a non-stick pan and spray with non-stick cooking spray. Once the pan is hot, pour a small amount of the pancake batter into the pan. When you notice that the edges of the pancake are slightly dry, flip to cook the other side. Cook for at least 40 seconds. Repeat with remaining batter. Serve the pancakes while warm with some syrup, and garnish with the Lucky Charms™ cereal. Cook the pancakes at medium-low heat to make them an even darker green. Saint Patrick’s Day has arrived and we should all dress in green to avoid being pinched! At least that’s what tradition dictates. But why not take the green thing even further and have fun with a shamrock-colored breakfast? It was actually my husband’s idea, since he’s the pancake expert in our house. He mixed all the ingredients in his family’s recipe, which has been passed down from generation to generation, and then added green food coloring to the batter in celebration of St. Patty’s Day. 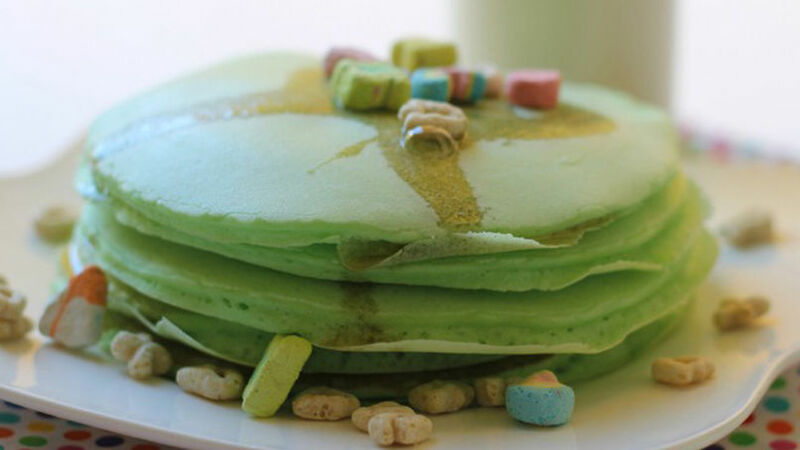 Like a cherry on top of the cake, he decorated the pancakes with Lucky Charms™ for an irresistible breakfast. These cakes turned out spongy, soft and of course, magically delicious!